ALS may be suspected whenever an individual develops insidious loss of function or gradual, slowly progressive, painless weakness in 1 or more regions of the body, without changes in the ability to feel, and no other cause is immediately evident. In lower motor neuron (LMN) involvement, fasciculations may occur early on in the disease, particularly in the tongue and limbs. Patients with upper motor neuron (UMN) involvement generally are hyperreflexic and stiff. Reflexes may be diminished due to LMN involvement. UMN symptoms may include spasms and sudden, uncontrolled straightening movements of the lower limbs. In 75-80% of patients, symptoms begin with limb involvement, while 20-25% of patients present with bulbar symptoms. For those with limb involvement at presentation, the frequency of upper limb versus lower limb involvement is approximately equal. Patients with upper limb onset have twice the likelihood for onset in the dominant arm, compared with the nondominant arm. 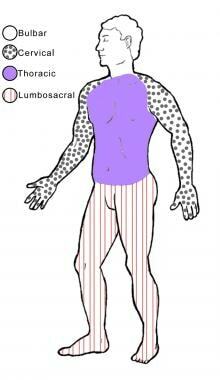 There is equal likelihood for presentation in either lower extremity. Women have a greater frequency of bulbar (speech dysfunction) onset than men. These observations suggest a greater likelihood for network dismantling to start where there is a better-developed, or more complex, cortical network. Patients who have lower limb onset initially may complain of tripping, stumbling, or awkwardness when running. Foot drop is common, and patients may report a "slapping" gait. Persons with upper limb onset may experience reduced finger dexterity, cramping, stiffness, and weakness or wasting of intrinsic hand muscles. This may lead to difficulty with actions such as buttoning clothes, picking up small objects, or turning a key. These patients may develop wrist drop. As ALS progresses, muscle atrophy becomes more apparent, and spasticity may compromise gait and manual dexterity. Immobility, if coupled with spasticity, may lead to the development of painful joint contractures. Muscle cramps are common. In some patients, persistent stiffness or cramping of muscles may stress the related joints and the back. This can usually be ameliorated with medications and physical therapy exercises to relax the muscles and maintain joint range of motion. A mixture of spastic and flaccid components may characterize speech, resulting in a dysarthria with severe disintegration and slowness of articulation. Hypernasality occurs from palatal weakness, and patients may develop a strained, strangled vocal quality. With time, speech may be lost, and patients may become dependent on other forms of communication, such as writing, communication boards, or speech-generation devices. Patients with bulbar involvement may develop swallowing difficulties (dysphagia). Swallowing liquids requires the greatest oropharyngeal muscle control; therefore, patients usually report more difficulty with liquids than with solids. Aspiration or choking during a meal may occur. Drooling affects some patients and results from a combination of excessive salivation, poor swallowing, and poor lip control. The problem can usually be ameliorated effectively with oral medications or a scopolamine patch, but other methods, such as salivary gland irradiation or injection of botulinum toxin, are sometimes required. These consist of exaggerated, involuntary emotional responses. The response may be of one type (laughter or crying) or, less commonly, alterations in emotive expressions. Episodes of intense laughter may be followed immediately by tears. The patient's response often does not correspond to an apparent social stimulus or the current psychosocial situation; it may instead be an exaggerated response to a minor trigger. The patient is aware of the lack of control. Symptoms can often be ameliorated by medications. Certain motor neurons usually are spared in ALS, which means that some functions are preserved. Most patients retain extraocular movements and bowel and bladder control. With progressive disease, patients may develop problems with urge incontinence and constipation because of weak abdominal musculature, but sphincter control generally is unaffected. Since the disease primarily involves motor neurons, sensory function typically is preserved, although a minority of patients complains of some numbness and paresthesias. Abnormalities have been reported on sensory nerve conduction studies in a small number of patients with ALS,  but these findings often reflect the presence of an unrelated, coexistent condition. Skin integrity in ALS usually is maintained, primarily due to the combination of preserved sensory function and continued control of bowel and bladder function. Some studies of patients with ALS have found morphologic changes in the skin that are complex and poorly understood but that may contribute to preservation of skin integrity. Obtaining a thorough family history is pertinent in the examination of all patients. Patients with a family history of Mendelian ALS may be considered to have definite ALS as soon as any evidence of motor neuron disease arises that cannot be accounted for by an alternative explanation, regardless of the extent of involvement. Some experts, however, require that the abnormal gene be demonstrated in the patient. Genetic testing is typically recommended when a mode of inheritance, most often autosomal dominant, is recognized, but the gene has not yet been identified in the family. The symptoms that some patients with ALS may experience and the signs that are found on their neurologic examination are summarized below. Not all patients experience all symptoms or have all signs. The key finding in an involved limb is a combination of upper and lower motor neuron dysfunction, as when a weak, atrophic, fasciculating muscle also has increased tone and hyperreflexia. While the symptoms of motor dysfunction in ALS are best recognized, affecting all patients with the disease, a fair proportion of patients also experience emotional and special cognitive difficulties. Emotional manifestations of ALS include involuntary laughing or crying and/or depression. Cognitive difficulties involve executive function impairment and/or behavioral changes. Bulbar symptoms manifesting as dysarthria or dysphagia are the most common ALS presentation next to limb involvement, affecting 20-25% of patients. Rarely, patients with ALS may present with respiratory muscle weakness, generalized weakness, or difficulty with head control. Those with respiratory muscle weakness may develop disturbed nocturnal sleep and exhibit excessive daytime sleepiness. Patients with axial truncal weakness have difficulty maintaining an erect posture when standing; to assist in attaining a standing position, they may support their torso by “walking” their hands up their thighs. Some patients feel more secure when pushing a heavy object on wheels, such as a grocery cart. The Awaji criteria consider equally the clinical and neurophysiological evidence of LMN involvement. Acute and chronic signs of denervation should also be taken as equivalent, with only one type of change necessary to imply limb involvement. In parallel, it has become evident that most patients with possible ALS who have progressive disease with lower motor neuron findings and in whom other causes of focal disease have been excluded are destined to progress and manifest the full spectrum of the disease, so that they may be considered to have ALS including for the purpose of enrollment into clinical trials. Finally, patients characterized as having clinically suspected ALS, due to absence of upper motor neuron findings, also named PMA (progressive muscular atrophy), have clinical courses that are usually indistinguishable from those of patients with ALS. The exceptions are patients with specific syndromes (e.g., brachial biplegia, lumbosacral biplegia) who tend to have a slower course, and some patients with particularly slow or fast forms of lower motor neuron disease. In addition, efforts have been made to introduce biological and radiological markers to assist in diagnosing ALS. However, most of the work evaluating these markers has been done in patients in whom the diagnosis was not in question. It is impossible to say if these markers would help make the diagnosis of ALS in individuals who do not meet clinical and electrophysiological criteria for the disease. In summary, earlier diagnosis of ALS is possible today in individual cases, relative to years past, if alternative causes for early, limited, progressive disease are excluded. The requirements to exclude alternate diagnoses and observe progression are more stringent in very early disease. However, in aggregate reported data of ALS clinic patients and of patients enrolled into clinical trials the average time from clinical disease onset to diagnosis has remained unchanged, and continues to hover around 12 months. The WFN uses adjectives that in usual speech reflect the degree of certainty. However, when these adjectives are applied in the context of diagnosing patients with ALS, they need to be understood as reflective of the degree of clinical involvement rather than the degree of certainty in the diagnosis, particularly if no alternative diagnosis has been found and the disease has progressed beyond a single limb. This distinction can be confusing for patients. Although the names of these regions appear to describe neurologic segments, the terms actually refer to functional regions of the body. For example, the small muscles of the hands are innervated by thoracic motor neurons but are counted in the cervical region. Originally, it was thought that the degree of certainty of diagnosis was increased by the number of body segments that demonstrated UMN and LMN signs; hence, the choice of qualifying adjectives. The criteria were designed to be usable even if no adjunctive testing was available, in which case the qualifiers did have implications in their literal sense. The qualifiers continue to reflect the extent of involvement at time of diagnosis or subsequent evaluation. Recruitment to clinical trials previously was limited to patients with definite or probable ALS (including probable, laboratory-supported ALS), but more recent clinical trials have included patients with “possible” ALS. Their progression has been affirmed explicitly. Patients with progressive bulbar palsy (PBP) may be classified, while the disease is restricted to the bulbar region, as having “suspected ALS” if only UMN or LMN abnormalities are evident, and as “possible ALS” if there is UMN and LMN involvement. When neurophysiologic or clinical spread beyond the bulbar level is evident, the condition would be reclassified as probable; laboratory-supported, probable; or definite ALS. In day-to-day practice, clinicians will inevitably use the term suspected ALS whenever they believe ALS to be a possibility, regardless of the extent of clinical involvement at the time, and may or may not use the WFN qualifiers when they conclude that the patient has ALS. This leads to clearer terminology in practice; the patient is either suspected of having ALS or confirmed as having the disease, or a different diagnosis is made. The term “suspected ALS” has special meaning in the WFN classification system because it is applied to patients with a pure UMN presentation, particularly if they cannot yet be diagnosed with primary lateral sclerosis, and to patients with a pure LMN presentation (particularly early in their presentation) before enough time has elapsed to be sure that their condition will remain restricted to LMNs and might therefore be more precisely described as PMA. This has a practical implication, because patients with primary lateral sclerosis have a course that is measured in decades (approximately 20 y). Some patients with a predominantly UMN form of ALS may also have a longer course than those with classic ALS. Since the distinction between a diagnosis of PMA and one of laboratory-supported probable ALS hinges on the identification of 1 UMN sign at some point in the patient’s disease, this distinction may be primarily of significance to researchers. For clinicians and patients, rate of progression is likely to be of greater concern, as it is the factor that determines the patients’ course and outcome.